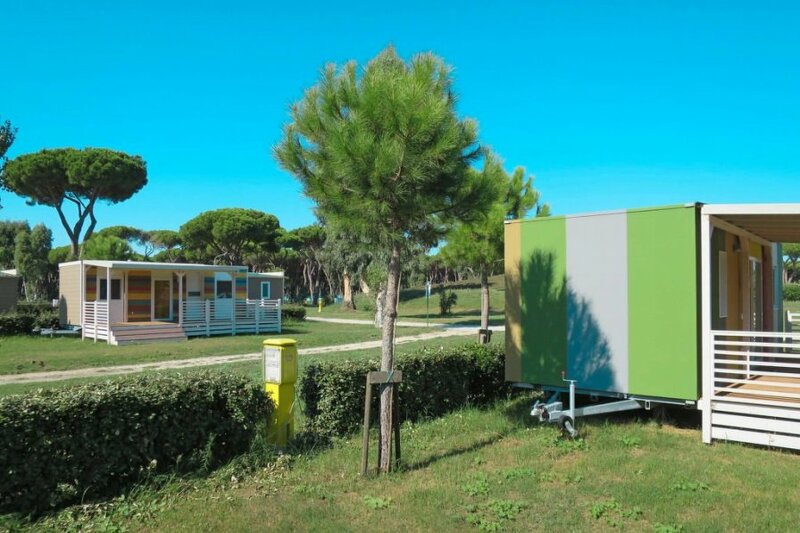 This 2 bedroom apartment is located in Ostia Antica and sleeps 4 people. Mobile home, 4 people, 3 room/s, 2 bedroom/s, 1 bathroom/s, approximately 24 m², 1 floor/s, year of construction 2018, access to the property via external stairs. Furnishing: modern, bright, laminate floor. Equipment: satellite TV; internet access Wi-Fi (payment); combined heating/air conditioning (in the living room). Air conditioning if required, € 7/​day. Final cleaning by tenants or against payment, € 70. Holiday resort tax. Linen/towels must be brought along. Bed linen available on loan, € 12 per double bed/​change, € 10 per single bed/​change (on order). Towels available on loan, € 10 per person/​change (on order). Cot only within the maximum occupancy, € 3 per day (on order). Pet 1 pet allowed, € 6 per stay (please advise prior to arrival; additional animals on request only). Internet € 5 per day. Access/parking: parking in the holiday complex (payment, depending on availability). Estate (shared use): approximately 14 ha, closed plot (fence), trees, meadow. Pool (shared use): 25.0 x 12.5 m, 1.20 m deep, 01/05/19-30/09/19. Pool area: tiled, sun loungers (payment / depending on availability), external shower. Please note: distance to the pool approximately 200 - 250 m.
Pool 2 (shared use): 450 m², 0.30 - 1.10 m deep, 01/05/19-30/09/19, curved shape, children's pool. Sports facilities/ leisure time: shared use (free of charge): football pitch, beach volleyball, multi-purpose sports track, children's playing equipment (available during the whole season). Infrastructure: reception; washing machine (shared use, payment). Bar/cafe, restaurant, food shop (available during the whole season); breakfast, half board, full board: payment and request on-site. Important information: Please note: When a pet is brought along an additional cleaning fee of EUR 70 applies. The agent describes this apartment as a family friendly holiday rental ideal for the summer holidays. For younger guests there is some vibrant nightlife not too far away. It is also good value for money. This apartment is located in Ostia Antica. It is set in a very convenient location, just 0 metres away from a beach and only 2.5km away from the city center. The apartment is suitable for activity holidays during the summer as well as family friendly summer holidays. It is also suitable for elderly guests.